Medical-Graded Wireless Network – Throughwave (Thailand) Co.,Ltd. Mobile hospital information system (HIS) is one of the trend for healthcare markets. Wireless HIS viewer, wireless PACS viewer, doctors and patients real-time location tracking and voice-over-WLAN usages are increasing to help saving lives in many hospitals world wide. But no one knows that if the wireless access points using in the hospital today causes some effects with other medical appliances in the hospital or not. And this is danger to the mission critical life saving operations. 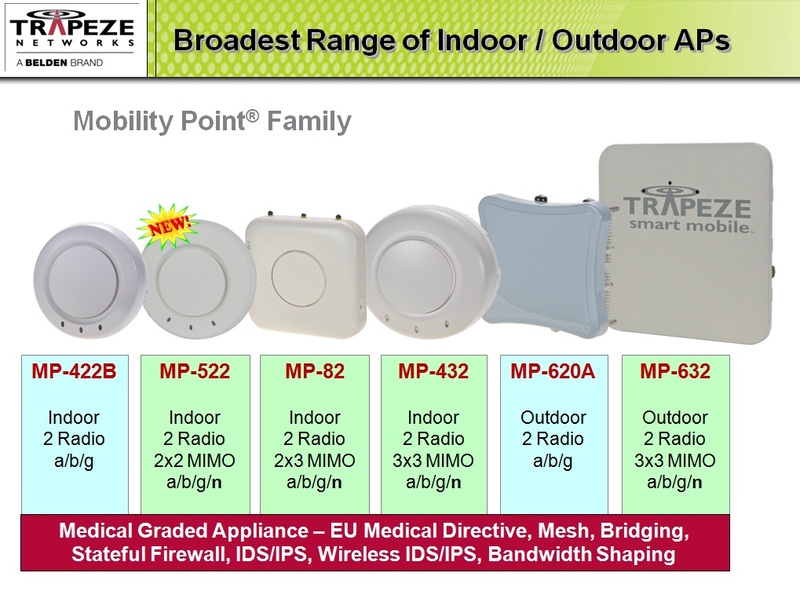 Trapeze Networks is the only vendor in the market that have the medical-graded wireless access points. All wireless access points pass the EU Medical Directive standards. While the other part of Trapeze Networks solution are specifically modified to support healthcare operation – performance, security and applications. Trapeze Networks also have the location tracking solution, wireless asset management solution, voice over WLAN inspections and wireless service billing solution to support all needs in the healthcare operations. See the High Performance Wireless Network for more information.